Dr. Ohhira's Probiotics World's No. 1 Selling Probiotic, Prebiotic & Biogenic Supplement. Award Winning Formula! The true wild oregano oil P73, a blend of edible species of wild oregano North American Herb. 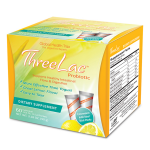 EPA and DHA found in fish oil, are essential for maintaining optimal mental & physical health..
ThreeLac is a powerful probiotic formulation of three potent microflora in a lemon-powder base.